When it comes to the ultimate quality and long-term success of your building, much of the results rely on the skill of the crews assembling the entire structure. From the concrete footings below grade to the roofing on top, every material must be installed perfectly for the best results. Drywall installation is no different, as the skill and precision of your commercial drywall company will help to determine the long-term quality of your structure or its inhabitants. Choosing the right crew for the job can mean all the difference, making it important for project managers everywhere to do their research and have a plan in place before signing on with their favorite drywall finishers. Failing to make the right choice can result in costly setbacks, unfinished projects, or dangerous outcomes! AZ Drywall Finishing is proud to be your trusted team of drywall contractors in Chicago, delivering honest results that focus on safety and efficiency to get your project done correctly the first time. We understand that it can be a challenge trying to find the right drywall company for the job, which is why today’s post will focus on a few simple tips to help you get started. If you are here because you are seeking out professional help for your project, be sure to call us today for an estimate! Preparation is key in making major decisions, and hiring the drywall contractors to meet your project’s specifications is one task that requires considerable effort. One way to locate a qualified company is to seek out advice from friends, colleagues, and other industry professionals to find first-hand results. Word of mouth still remains one of the most effective forms of marketing for many construction professionals. If your drywall finishers do a terrible job, you will likely spread the word to your associates to avoid the same experience! Internet research is also a convenient option for those more comfortable with touchscreens. There is a wealth of information online that can provide guidance for all of you concerns. We’re betting that this method was how you found this post! There are numerous websites available that take our previous tip into the digital realm, as professionals and homeowners alike can rate and review local professionals. This can help you build a list of notes and recommendations to begin for the next step in the hiring process. 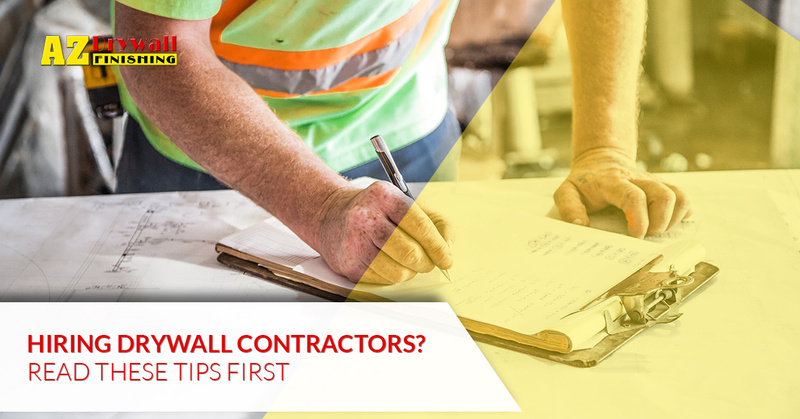 Once you have built a list of potential drywall contractors for your project, it’s time to call them up with a set of questions to help you gather more information. Installing drywall is an involved process, making it important for you to ask the right questions to determine the overall benefit of hiring this drywall company. The answers are important, but you want to also listen for any indications of the contractor’s confidence or lack thereof. An individual that cannot answer your questions clearly may not be worth further effort! May I see some referrals from your clients? How will you complete this project? How much will the total cost for your services be? The interview process is meant to help you find the best possible fit. Ultimately, the choice is yours, so be sure to ask the right questions! Once you have found the right drywall company, it’s time to begin the process of negotiating terms. Clarity and communication are essential here, as everyone needs to be clear on the terms, prices, and any clauses that may complicate future work. Our drywall contractors want to know how to best serve, and you want a clear and upfront price for your project! Your contract should detail the full range of services to be provided, as well as the conditions for any supplemental needs. Once you have your questions and referrals ready, be sure to reach out to AZ Drywall Finishing for an estimate! Our commercial drywall contractors help Illinois businesses achieve amazing and cost-effective results, relying on decades of experience to get the job done. If you’re in need of assistance in finding the right services for your project, be sure to contact us today!